Commercial and residential real estate bubbles choke the economy. The upper bounds of hype and craziness have been reached. The San Francisco Bay Area has seen an astounding jobs boom since the Great Recession. The tsunami of global liquidity that washed over it after the Great Recession, central-bank QE and zero-interest-rate policies that sent investors chasing blindly after risk, a blistering no-holds-barred startup bubble with the craziest valuations, one of the greatest stock market bubbles ever – whatever caused the boom, it created one of the craziest housing bubbles ever, a restaurant scene to dream of, traffic jams to have nightmares over, and hundreds of thousands of jobs. But it’s over. 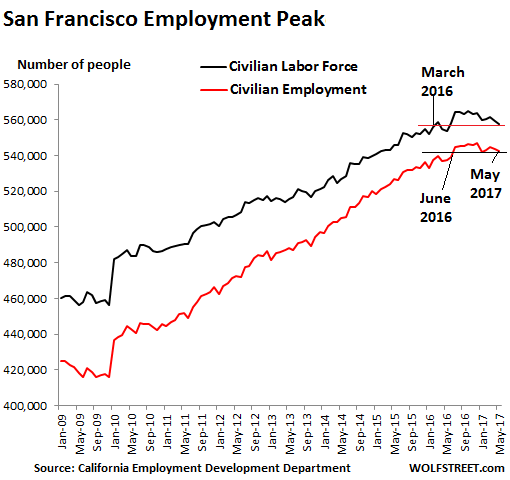 In May, employment in San Francisco dropped to 542,600 jobs, the lowest since June 2016, according to the data released on Friday by the California Employment Development Department. The employment peak was in December 2016 at 547,200. The labor force in the City fell to 557,600. That’s below March 2016! This confirms a slew of other data and anecdotal evidence: People and businesses are leaving. It’s too expensive. They’re voting with their feet. 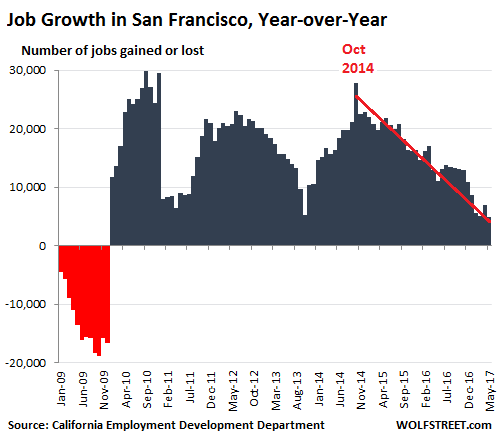 The year-over-year increase in May of 4,900 jobs in San Francisco was the lowest year-over-year increase since the plunge during the Great Recession. Between December 2009 (the low point during the Great Recession) and December 2016 (the high point since then), the City created 131,400 jobs. An increase of 31.6% in seven years! The city created on average 18,800 jobs per year over the period, a breath-taking employment boom for a city of 850,000 people. And San Francisco accounts for only 11% of the Bay Area population of 7.68 million. 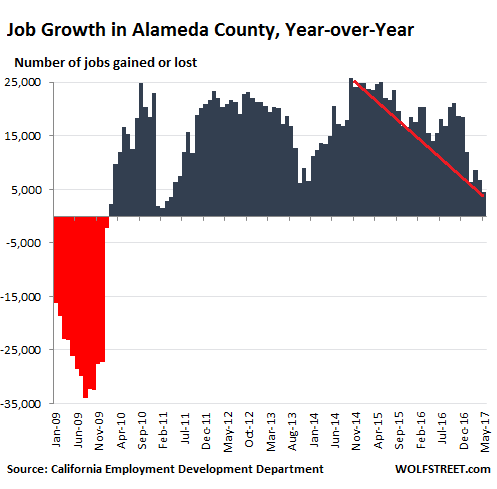 Across the Bay, in Alameda County, whose population is about twice the size of San Francisco’s, and which includes Oakland, Berkeley, and other cities, a similar scenario is playing out. The county created 134,000 jobs between the end of 2009 and the employment peak in December 2016. That’s an increase of 19% over seven years, or on average 19,000 jobs per year. But in May, the year-over-year increase was only 4,500, the lowest since January 2011 and December 2010, and before then since 2009. Don’t get me wrong. The Bay Area isn’t “collapsing” at this point. When you walk around in certain parts of San Francisco, you see tourists in astounding numbers. It’s still tough to get into popular restaurants though the other Saturday we were able to get a reservation for 8:30 PM, peak dinner time, by calling two hours ahead. Before then, we couldn’t duplicate that by calling two days ahead. But it might have been a fluke. By 9 PM, the place was full. Traffic is still a nightmare seven days a week. Home prices in San Francisco, after flat-lining for two years, suddenly spiked in May to another crazy record. Commercial real estate is hanging on by its teeth to sky-high prices, though apartment rents have dropped from their peak. But there are a surprising number of shuttered retail shops and restaurants, including some favorites. Landlords have become too greedy, and when they jack up rents at lease renewal time, the equation no longer works for the business. This doesn’t mean business is bad. It means commercial rents are too high. This has been duplicated in the office sector. There is still demand, but a number of companies, including Charles Schwab, are sending jobs to cheaper states. And when the work force is hightailing it though there are still plenty of jobs, it means that housing costs are too high. This is a universal complaint in the Bay Area. Nearly half the millennials said they’re “likely” to leave. This is how commercial and residential real estate bubbles with their uneconomical prices choke the economy. On top of the cost factors, there is the startup boom that is now grappling with a new sense of reality. A number of startups, such as NerdWallet, and more mature companies, such as Twitter, have laid off people. Others have stopped hiring. A slew of them shut down. Some companies are still getting funded, but the frenzy has been dialed down. And Uber, a San Francisco darling that is moving its headquarters to Oakland, is in a world of hurt. But this time, there is no financial crisis, which set off the last bust. And this time, the Nasdaq isn’t collapsing, which triggered the bust starting in 2000. The Nasdaq is hovering near all-time highs. Excess liquidity is still sloshing through the system. Financial stress is at historic lows. And the Fed’s policies, despite the upticks in its target rate, are still highly accommodative. The whole system is set on “go,” but in the Bay Area, it has reached the upper bounds of bubble hype and craziness and can’t go anymore. It makes you wonder how much of this deceleration in job growth is due to relocation of a good chunk of the tech industry to other cities with less expensive RE. Here in Seattle, the economy still seems to be booming as thousands of 20-somethings making $125k+ move north. Seattle Times has articles nearly every day about rapid population growth (fastest growing large US city for a number of years now), RE price appreciation, more construction cranes in here than NYC, etc. Anecdotally, it’s a lot harder to get a reservation at the nicer restaurants on Friday/Saturday nights than 5 years ago. You used to be able to dine anywhere in fleece and no one cared, now you better dress up. Many more 20-somethings in Teslas, Maseratis, Porsches than then too. I’m familiar with Seattle. Compared to San Francisco, it’s not far behind. Houses with 2,000 ft built in the 80’s that now have smell and dire need for renovation are going for $1M. Highways are almost unbearable. Restaurant wait times are ridiculous as you say. Who wants a $150k salary in this environment? Doesn’t seem like a good deal to me. Employers will have to start paying a lot more than they do right now. That’s too bad. I’m an older guy in fin serv considering moving to Seattle in the next few years, currently based in OC. Hopefully the youngsters will be turned off by the weather. I’ve met a lot of people who’ve moved back. To me, Seattle has a much different feel to it than SF. Perhaps it’s because Seattle suburbs haven’t been transformed by Asian settlers the way SF has. Give it some time. I read somewhere that Sotheby’s said 50% of its sales in the Seattle suburbs (read: Bellevue and the east side) are to Chinese nationals. You go to any decent open house in the area in the $750-1.25M range, and Mandarin will be the most commonly spoken language there. Regarding San Francisco, I was there last summer for a long weekend – I think the same sort of people there are the new mainstream culture in Seattle. Portland feels more authentically PNW to me, though that is changing rapidly too as the area becomes more and more monied. Well, it depends on where you go. Bellevue is essentially Asian and Indian. A third of people are Asian/South Asian and that includes the American children of any migrants. In a line of 10 people, 5 people are white. I see a lot of Asians too, but I wouldn’t say something is “essentially” whatever the minority is. Won’t affect much. I’ve said it again and again. It ain’t over till the Chinese rolls over. Watch out for Anbang. If that’s allowed to go BANG, it could take a lot of the Chinese financial sector. Here in Melbourne winter is here along with the winter doldrums in the RE market. Hard to tell yet if there has been any impact from all the new regs, restrictions, fees, and taxes on foreign buyers as those don’t start until 1 July. Also the banks here have been pushing up the rates on interest only loans. The auction clearance rate in Melbourne was 75% over the weekend which is down a little from last week (holiday weekend). In my little area there really hasn’t been much change. For the entire postcode area there are only 140 or so houses for sale in an area with a population estimate of 50,000 people. That population estimate will probably be revised up when the census data comes out later this year, but at least a 10% increase in population in five years. Melbourne will have added over 100,000 again in the past year. A look at the listings shows that over 1/3 of those are either retirement units or ‘off the plan’ units/houses not yet built. In the village area there really isn’t that much for sale. Only 8 houses all with prices over A$1 million. There are 11 units (condos/townhouses) starting at A$655,000 of which most aren’t even built yet. Highest priced unit on the market is A$970,000. In the postcode area I counted 26 places for over A$1 million – highest priced house now on the market with a price listed is A$3.9 million. Then there are a bunch in the A$900,000 plus area. The cheapest house is listed for A$450,000 – A$500,000 and the cheapest townhouse/unit is at A$420,000. Who would want to touch Australia’s real estate? Australia’s personal debt is some of the “highest in the world”, but what does this really mean? Australian household debt has steadily risen over the past three decades as more of us aim to own homes and continue to rely on products such as car loans and credit cards. In fact, the ratio of household debt to income has more than doubled between 1995 and 2015, going from 104% to 212%, according to the OECD Data released in 2015. This means if the average person earns $80,000 net, they are spending $169,600 per year. While many other developed countries have seen a decline or “levelling out” of personal debt since the 2008 global financial crisis, Australia’s debt levels have continued to increase. As a result, Australia is now reported to have some of the highest personal debt levels in the world. So far no impact on real estate prices! We haven’t looked in the Bay Area for a while but last time we went, stopped at a local sandwich place and chatted with a long time resident – she had apparently bought 25 years ago, and they felt like the area was no longer recognizable. She ended the conversation with a strong recommendation NOT to buy there. In our neighborhood in LA, every open house is mobbed, and 75% are Chinese speaking with Chinese speaking agents. Within the past 5 years, sometimes it feels like the only new residents are Chinese! I speak Mandarin and it’s funny to listen in on their concerns – is there good energy, does the house face South, how are the schools etc. I joked we should pick a North facing house with a bad school district and bad energy. This data probably doesn’t exist because it’s highly local but it would be interesting to see what percent of buyers are all cash Chinese in certain parts of the Bay Area and LA. If it is not locals buying anyway, and they therefore don’t need a job or a mortgage, the local economy and job market don’t impact real estate much then! Word of past studies, cannot recall the sources, is that LA real estate is sold 60% of the time with “all cash, no contingencies”. A lot of sixty-plus aged people, no kids, downsize from $1.5 million homes to $900,000 homes (2 bdrm 2 bath) or townhouses, and they pay all cash with good chunk of change, and “one time exemption” on capital gains. Chinese buyers everywhere. Busing them around in Seattle, my sister tells me. I would estimate that Bay Area home selling is 75% “all cash, no contingencies” especially the homes close to UC Berkeley. Climate is key. $185K homes in Merced. $349K in Merced gets you 2000+ sq feet, swimming pool, nice neighborhood. Roasting summers, but dry heat (unlike Minneapolis, with 80% humidity and 85 degrees, 24/7 for days and days). Chevron saw the writing on the wall in the 1980s. They built a San Ramon Campus in 1982-1992, and every downtown SF employee left for San Ramon. Chevron sold its historic 225 Bush building it owned since 1920s. Top employee recruits would not sign on, while in SF. Dingy Mission apts, for what you could get in Texas (palatial home with pool). No sale. Large influx of Chinese money in the bay area. Wolf has an excellent video link on this site, “million dollar shack”. It’s an ominous highly accurate depiction of what we’ve been seeing at least for the last 5 yrs. That is less than 1% growth. Usually working Full time ? Does this number exclude part time restaurant and hospitality workers ? I think you mentioned fairly recently that there has been an inordinate number of new eateries and restaurants sprouting up in the Bay Area over the last couple of years. Regardless, that 1% y/y number is anemic when considered in the context of the amount of additional commercial office space under development. That level of detail in the data is not available for San Francisco county alone. But the data is available for the combined counties of San Francisco and San Mateo (just south of San Francisco), with total payroll of 1.11 million. As you suspected, year-over-year, “restaurants & hospitality,” added the most jobs. Next: educational services, “Trade, Transportation & Utilities,” and construction (building boom), in that order. “Information” and “financial activities” were at the low end. Professional and business services had an actual decline. But even with loss of employment, the region’s economy doesn’t necessarily have to suffer, does it? If 5 middle income employees are replaced by one high net worth couple selling the exurban McMansion and moving into the Millennium Tower — can’t the overall economy remain stable? For a number of years, SF has been drawing high net worth folks from all over the globe, and if they keep coming in droves I would think the City could continue to prosper. This is true, in my opinion. Lots of people who are not “employment constrained” come in. They are rich, and move to the areas with rich people, and the culture of rich people. This is important. They could live anywhere. Years ago, I talked to an Indian engineer, who described the palatial place he could buy in India, with ten servants. But you dare not drive your Mercedes anywhere but up and down the driveway! The culture that surrounds you. What I see is a bifurcation: lots of restaurant people, lots of multi-million net worth in those restaurants, going to Opera Opening and Symphony, the service people living in half-bedrooms with a blanket wall…contract-enforced!! Also, high crime areas like Hunters Point being invaded by Millennials who take on “siege mentality” and tough it out until others can move and offer numbers to change the crime rate. I left San Francisco three years ago and moved to an area with a lower cost of living. My salary was $100k and the person that bought my house made $350k + stock. He also submitted proof of funds to pay cash for the home in the event it didn’t appraise or if there were any issues with his loan (there was no loan contingency, even tho he got one). So many of the people coming into the City are quite well off financially. And those who are moving away (and “cashing out”, as I did) are — at least in a relative sense — less so. I think there is Census migration data to back this up. I would say no because there is a finite limit to what each person will consume and we need consumption to keep driving our economy. The replacement rich person isn’t going to buy 5x as much food, 5x as much clothes etc even when measured in price. They simply save more and less money is then circulated through the economy causing all of the shuttered small businesses you see. I wonder how much of this employment has to do with H1B visas. Trump’s policies have led to longer times to do even an h1b transfer. A few years ago, you’d see fresh faces from india. Now, you see h1bs show up from other states — Bay Area is now importing h1bs from other states. But now even that has stopped. The uncertainty with the transfers is huge and there is a fear of rejection in the air. I know people who were jumping ships a few months ago, at will. Now, employers ask you if you need visa transfer and they don’t seem to be planning for longer time horizons. Put another way, they are now looking for people who’d hit the ground running on day 1. This usually means that hiring is happening in companies that need to complete projects rather than do product development. In companies that require visa transfer within, the trend is against h1b transfers due to longer time horizon. The point is that it may not be money that is drying up. Instead, it may be the pipeline that is not supplying workers anymore. The bubble may be starving out. I am not seeing a trend against h1b imports and transfers in Bellevue, WA. On the contrary, these last 12 months have probably brought the most robust inflow of H1B’s and their families into the Bel-Red region ever. I’d say at least 5,000 new arrivals in the last year. Perhaps closer to 10,000 new arrivals, when you add the smaller cities of Issaquah and Sammamish. These numbers are quite remarkable when one considers that the cities of Bellevue and Redmond have a combined population of just over 200,000 people. The H1B transfer issue started after Trump came to power, which is about 6 months ago. I am guessing we’ll see more of this effect in the next few months. Here in Bay Area, we are seeing the effect of policy. Also, there has been a huge outflow of Indians from Bay Area to Seattle in the last year. Most went to join Amazon. That might explain the numbers you are reporting. BTW, when I say H1B, these are people actually on H1B. This is not a generic term for all Indians. Yep, it’s just too expensive, even some Google employees can’t afford housing here. Ooops…. 300 people instead of 2,000 – 3,000. Given the problems Uber is having, are they still adding to their workforce? Does anyone know? High tech is America’s last hope for ‘growth’. And it is a pipe dream I’m afraid. High tech will not bring the kind of productivity gains that we got from the industrial revolution. America is sinking into a pit of stagnation, high tech, Chinese idiots or not. All these high cost cities will stagnate. Their economies may not necessarily ‘collapse’ but there is a limit to how much they can inflate. Happy Fathers Day for all you Dads out there. “The upper bounds of hype and craziness”? Nice to see you comment again. Do they make an app that fixes bridges and subway systems? SF is a tech no-go zone. I agree, H1Bs are not slowing down in the Seattle area. My friend is in a new neighborhood up north in the Bothell area & it is 80% Indians & growing. Bellevue seems like the place where most of the rich Chinese are congregating. Where do you live Jon ? Way better than Seattle ? If rent gets too high business who can’t pay it move somewhere else. And with the current economy consumers are always wanting to save bucks. A high rent also means high prices to pay said rent. I give them five years at most before their greed destroys the whole city economy. And that being an optimistic maximun taking into account foreign tourists and an aggresive campain to make people from all over the world visit Frisco. See, when people of the world think of the US what it comes to mind is Miami and New York and I bet about half of them don’t even know Miami is part of the USA. What they knoe of Frisco? Basically TV series that took place there, that’s it. The net benefit / value added on this second go around doesn’t compare to 2000. This is why the pressure to reduce labor costs are higher this time, and profitability is lower. Look at CRM and WDAY their sale per employee aren’t as good as ORCL or SAP. Look at how TWTR is shrinking. Of course employment is topping. Real estate is the limiting factor, but the benefits aren’t aren’t as good this time around but real estate capacity is tighter this time around again. Still costs have squeezed restaurateurs to the point they can’t make a buck. I met a couple a year ago that had moved from SF. They had two kids. He had a restaurant in the Financial district NORTH of Market. He said his labor costs had gone up and that millennials didn’t do lunch the way older clientele used to. they bought trendy stuff that didn’t pay the bills as much. His wife had a wine distribution business. They moved to Richmond VA, bought a bigger house and kept a nest egg from the home they sold in SF. Part of this was a shift to South of Market, but I think there are too many people realizing as Wolf said that when you add the cost of real estate to the labor costs (and City unreasonable rules and regs) it is just too much. This is the overstretched blow off top. Everything is out whack and it is starting to not make sense in too many areas. People with high incomes and access to lots of money!! When the price of housing in certain suburbs near the CBD is going up by 20 or 30% a year those people will jump on the bandwagon. Those houses and price appreciation really distort the overall data. You can buy three or four houses out in the ordinary parts of Melbourne just with the price appreciation on one of those houses in one year. I wouldn’t buy in those areas if I could – the traffic, noise, and congestion are really too much. Went to through Toorak the other day and it took forever to get to where we were going. No thanks. You can still buy really old houses on small blocks in a place like Ballarat (105 kilometers from Melbourne) in the A$200’000s. Unfortunately you don’t get much for that and employment would be limited. Transport to Melbourne is the big problem with the train taking 73 minutes – when it actually runs!!! By car, I have no idea, but it must take forever with all the trouble on the roads. Anecdotal evidence: One month ago my son, who lived in Oakland and worked in San Francisco, left for Auckland, NZ to take up work there. He leaves behind two rental properties, and a desire for a life’s fabric not characterized by traffic challenges, conspicuous consumption and homelessness. – I think it also can be blamed on the high level of taxation in California. Wolf, Perhaps an early call, You can see similar downturns in 2011 and 2013 YOY graphs for both the counties. We may be flattening out. Maybe… But I’m getting a lot of preliminary data in that direction. I didn’t post the charts for some of the other BA counties. I will next time. 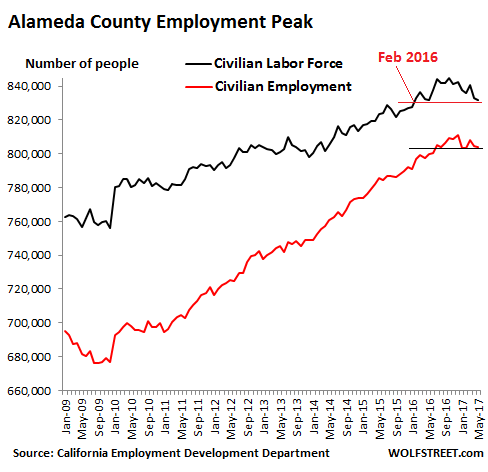 Marin County, for example, already had a year-over-year decline in employment in May, now lower than it was in Feb 2016! San Mateo County dropped to the lowest since June 2016. And so on. LinkedIn reported a significant drop in hiring in May in the Bay Area (though for the rest of the US, hiring was booming in May, it said). Another friend of mine packed up and left over the weekend, after he couldn’t find a job (chemist) in San Francisco. Right now, he is towing a U-Haul trailer back to his parents in Cincinnati. I keep hearing this stuff… and it’s starting to show up in the numbers. I’ll keep reporting on it. So we’ll see how it turns out. Looking at the 100+ degree weather in every less expensive direction. SF is beautiful but the POLITICS, REGULATIONS, COSTS are atrocious. I wonder what keeps folks like wolf here.